WHAT I USED After looking for the perfect fabric, I settled on this pink and white polka dotted print. Since I originally was going to make a skirt with this fabric, I only bought half a yard which ended up being just enough to make the dress. 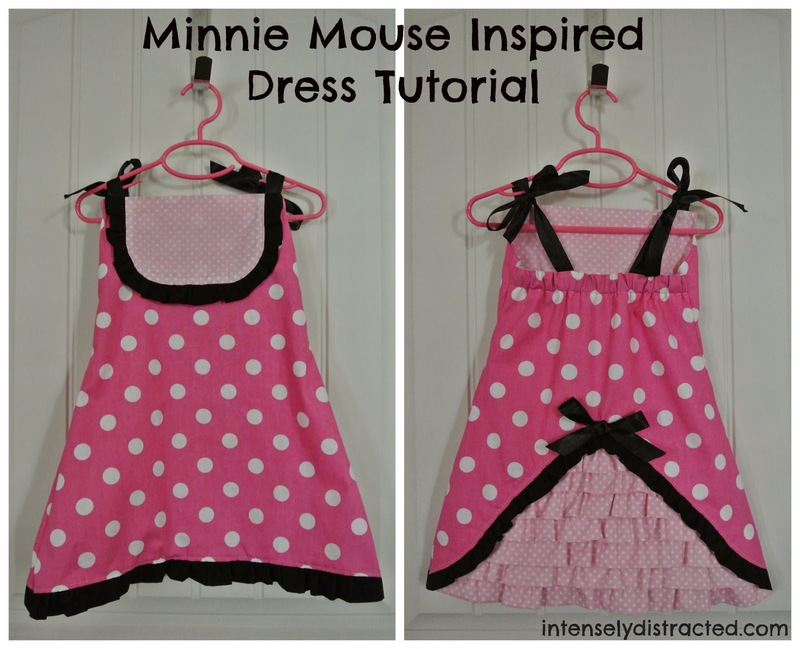 For the contrasting fabric used in the bib and the back ruffle, I used a smaller scale pink and white polka dot fabric that I already had on hand. The black used for the other ruffles was also another I had on hand. The straps and the bow were leftover satin ribbon from another project. I also used elastic for the back. All were originally bought from Joann's. Step 2: Cut 2 pieces. One for the front and one for the back. Step 4: For the bib, cut out a U-shape from a contrasting fabric. Use the front piece to gauge the size you want. (In retrospect, I would have made the big smaller than what I did here.) Cut a long strip for the ruffle. I used black fabric which was roughly 2.5 inches in width. Fold it in half, ruffle it, and pin it along the edge of bib with right sides together. Sew in place. Step 5: Fold over ruffle and iron flat. Pin bib in place on front dress piece. Sew in place along bib. Step 6: Cut a piece of fabric the width of the dress and long enough for the back opening. (Alternatively, you could use that back curve piece you cut out before to cut out a slightly larger piece. I decided to do this because it seemed like a good idea at the time.) This is where your back ruffles will go. Cut out strips for your ruffles. The longer the strip, the more ruffly it'll be. My strips were about 4.5 inches wide. Fold strips in half, ruffle, pin in place, and sew. Start with the bottom ruffle and work your way up, making sure each row of ruffles overlaps the bottom ruffle. Step 7: Cut out more strips for the hem of the dress. I made these the same size as the bib ruffle. 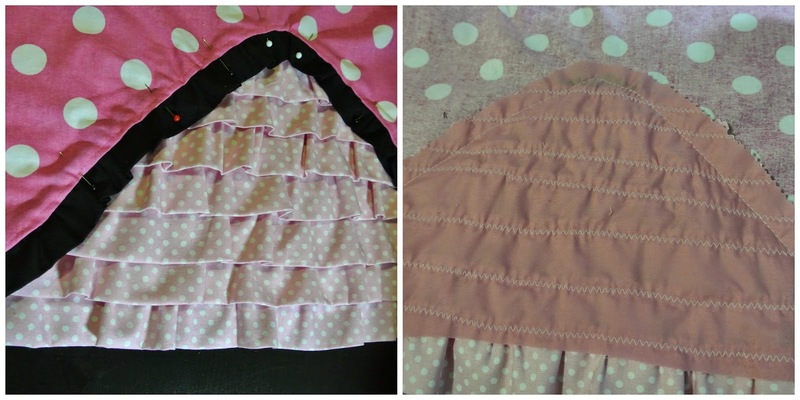 Do the same ruffle thing as before: Fold in half, ruffle, pin with right sides together, and sew. Fold ruffle over and iron flat. Top stitch the front dress piece. Step 8: Pin your back ruffles in place with the back dress piece. Top stitch. Step 9: If you made your back ruffle piece too large like me, this is the time to cut it down so there isn't too much unnecessary fabric there. I used my zigzag scissors so the fabric wouldn't fray too badly back there. Step 10: I don't have pictures of the rest of the steps so hopefully this makes sense. At this point, you can decide to add elastic to the back or leave it. If you decided to cut straight rectangles, you would just need to sew the sides together, add an elastic casing at the top (again, this is optional) and add ribbon for the straps. If you want to do what I did, I decided to add a lining with the contrasting fabric. I pinned the ribbon in place before sewing the lining in. After that, I added an elastic casing to the back dress piece where I fed the elastic through before sewing the sides of the dress together. Step 11: For the finishing touch, I hand sewed a bow to the top of the back hem. Again, this is totally optional, but I found it to be a cute addition. As you can see, this dress would work well over a black shirt too. I originally had Isabelle wear a cap sleeve shirt underneath, but then it got too hot so I took it off. Because I didn't have Isabelle around when I sewed the ribbon on, the straps ended up being too far apart and kept slipping off her shoulders. In the end, I just tucked the back straps into the dress and tied the front straps halter style. 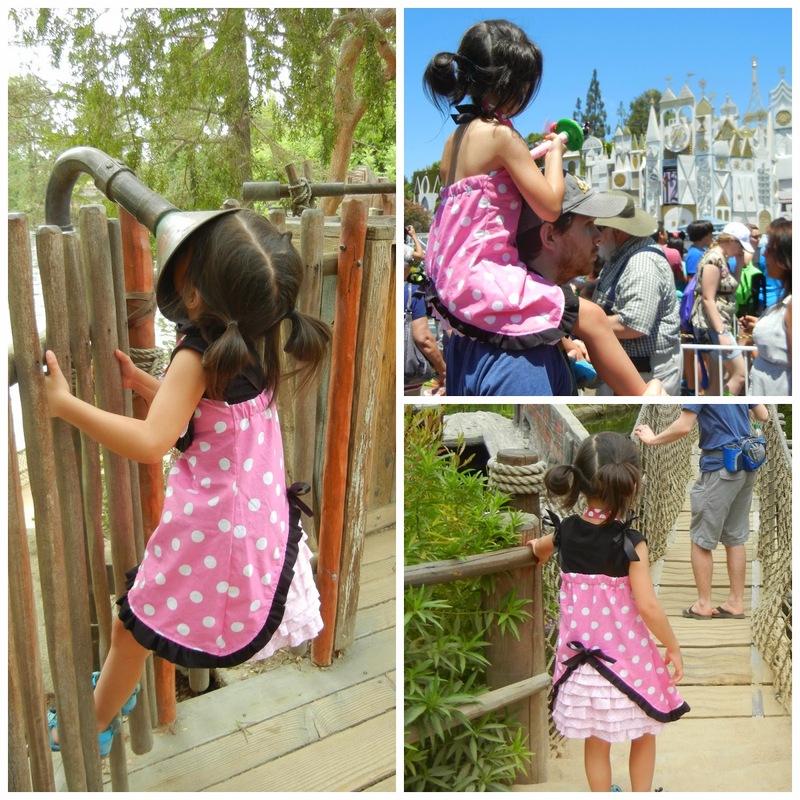 This dress was a fun one to make and it ended up being the perfect dress for our Disney vacation.